Fantastic site! I never realised that there used to be so many stations in the area. Its appaling that so few are left... Keep up the good work! My daughter and I have just found this site from the link off the Old Ladywood website. I used to work on the trains from 1948 to 1950 at the Monument Rd station and it was lovely to see the old picture of the station. I worked on the footplates of the trains, My step father also worked on the railway as a signalman at Monument Lane signalbox from the mid 1920's to his retirement in the 1950's. His name was Henry Austin Rutter and he worked on the railways all his life. My Mothers brother, Alfred Joseph Withers was also a signalman at the same box and as far as I'm aware he was there till at least 1955. It was through their friendship that my mother and Henry got married. 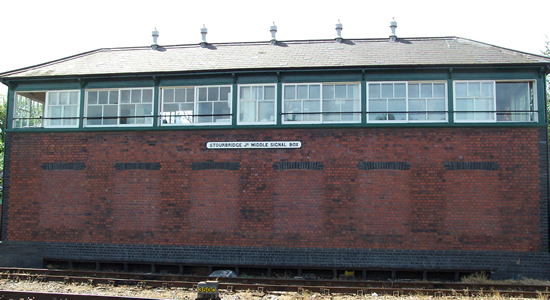 I can remember that the first signalbox out of New St was Sheepcote Lane, which controlled the engine sheds, then there was Monument Lane, then Harborne junction, which had 3 lines running from it, one running to M&B's and the sand pits at Harborne, the mainline to Wolverhampton, and the third went down to the Stour going to Great Barr and beyond. I am now racking my brains for names of people who I knew whilst I was on the trains and can remember a Mr Lonsdale who was the district loco superintendant at Sheepcote Lane engine sheds. I shall be adding this site to my bookmarks and will be looking in often to see what other things are added. Informative! I plan to be in the area next month, now I can do some train-spotting! Thanks! your pictures of spon lane station bring back great memories. finishing school at spon lane dashing down to the station and jumping up onto the brige wall shown in your picture to do some train spotting. oh yes it was all so simple then !!!. brilliant site keep up the good work.. The square mellow stone building on the header page looks like it could have been built by a distant descendant of one of the Nabatean craftsmen who created Petra. Just a personal opinion of course. Interesting, well done site. Great site i have always wondered if the building at the top of my road used to be a train station and it turns out i was right and it was the Hazelwell station and to find out the was a whole line operating through Moseley and Kings Heath. Very intresting site. Great to see your latest additions,Andy,particularly the Longbridge shots. Wonder how many train spotters are still around who enjoyed that area as kids early in World War II when,for a change,we could bike up Lickey Road,turn left into Lowhill Lane and watch Austin's latest output from Cofton Hackett,the Fairey Battle taking off for test flights from the airstrip that ran parallell with the road. A bit later in the war if you were watching rail traffic from Groveley Lane bridge you could see major sections of their second war product the Short Stirling bomber being wheeled across the public road from a shop on the north side to that on the south. What a great web site, seeing the pictures of Smethwick west station was sad as i had spent a lot of my younger days watching and catching trains from here,i have a few pictures taken in the late 80's of trains at this station and also the signal box,if interested. p.s what happened to the signal box after closure was it domolished for good or did one of the preserved railways take it away for future use?.